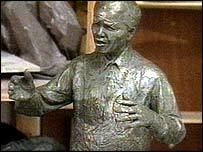 London's mayor has lost his appeal over the siting of a bronze statue of Nelson Mandela in Trafalgar Square. Ken Livingstone wanted the 9ft tribute to the former South African president to stand on the square's north terrace. Last year Westminster Council rejected the idea, saying the terrace was not the best location. The mayor appealed to the Office of the Deputy Prime Minister, which has ruled in favour of the council, saying it would not suit the area's design. The Greater London Authority (GLA) said it is now seeking legal advice. In the ruling, which came after a three-day hearing in September, the secretary of state said the symmetrical layout of the North Terrace was essential to Trafalgar Square. The ruling said the "uncluttered and calm nature" of the space would be unacceptably compromised and it would hinder the organising of events in the square. But it said the deputy prime minister supported the principle of a Mandela statue in an alternative site. The council has suggested placing it outside South Africa House, also in the square. Westminster City councillor Angela Hooper, chairman of its planning committee, said: "It is a matter for regret that this planning appeal, with all the attendant cost to the public purse, was forced upon us, but we are pleased that our view has been upheld." A GLA spokesman said: "As the authority responsible for revamping Trafalgar Square we strongly disagree with the suggestion that a statue of Nelson Mandela would detract from the appearance or character of Trafalgar Square. "On the contrary, a statue of the man who symbolises one of the most important struggles for justice in the 20th century would enhance the character of the Square. "Equally, as the body which authorises events on the square, and indeed organises many of them, we strongly disagree with the idea that a statue of Nelson Mandela would have a negative impact on the planning or operation of events on the square."